There are almost 12 million recreational watercrafts registered in the USA, and about 4 million boat owners go sailing at least once per year. If you’re among those happy few, odds are you’ve faced issues pertaining to boat shipping already. To keep the costs of transport down, you can always use a bidding company such as CitizenShipper, CargoBid, or Shiperoo. If you’re considering that route, here’s a few boat shipping tips that’ll make matters a little easier for everyone involved. Before reaching out to professionals, it’s good to have an idea of what their service is going to cost you. This rough estimate is just that – no more, no less – but it can inform your negotiating position. The main factors influencing boat shipping rates are the distance traveled and the size of the vessel. For illustration purposes, let’s assume an average beam width of 10 feet. With boats of that size, the industry standard is about $2-$3 per mile. So for a journey of 1,000 miles, your estimated cost of transport might be about $2,500. Again, the purpose of this estimate just a rough sense of what kind of bid you can expect. Don’t stick too closely to it – drivers might bid considerably higher or lower depending on other factors. For example, if the boat width is closer to 12 feet, the shipping costs should increase by about $1/mile. Once you’ve got an idea of what kind of expenditure you’re looking at, go ahead and post your shipment. Make sure to include all the relevant details about the boat. When the driver bids start coming in, all you have to do is review their offers and pick the one you like best. Price. The lower — the better, but common sense applies (see below). Experience. Drivers with experience in boat shipping are usually your best bet. Reputation. Obviously, you can’t go wrong with a highly-rated driver. At this stage, you might encounter a common snag: bids priced much lower than your initial estimate. If you’re the suspicious type, you might skip over these offers, thinking them too good to be true. But in fact, these bids are almost certainly genuine. The drivers are saving money through stacked shipments, which lets them entice you with those low, low prices. Don’t be too cautious to deny yourself this opportunity. Once you’ve found a driver that fits your criteria, just accept the bid and wait for them to get in touch – it really is that easy. Regardless of what you may or may not have heard, size can be absolutely vital (in boat shipping). The width, length, and height can present challenges when navigating the roads. Some state laws restrict the transport of oversized boats to certain hours of the day, which is a common cause of detours and delays. As the boat’s size affects the drivers’ bids, make sure to include all the measurements when posting the shipment. Beam width is measured at the widest point of the vessel. Height is measured from the highest non-removable fixture to the bottom of the keel. Length is measured from the tip of the bow to the middle of the stern. Listing these correctly should help avoid misunderstandings later on. 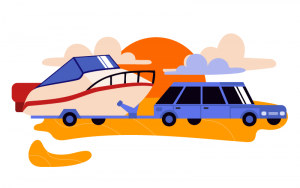 While discussing details of the shipment with the driver, you might want to consider the planned route if the boat’s dimensions make certain roads inaccessible. However, most shippers prefer to leave these specifics to the driver’s discretion, focusing only on the date of the delivery. Drain all the fuel tanks and water tanks to no more than ¼ capacity. Disconnect all batteries, and make sure there are no loose cables around. Secure all doors, windows, and hatches on the boat, locking them if possible. Remove all detachable parts from the deck and store them safely away. This might include anchors, cushions, canvases, hardtops, instruments, consumer electronics, and more. If using your own trailer, confirm that all its tires, lights, and latches are operational. If using the driver’s trailer, make sure that there’s enough space available for loading and unloading. With these preparations out of the way, you should be good to go. Consult the driver directly if you have any specific boat shipping concerns not discussed here. You’ll find that most drivers are as flexible as they are considerate, and expect the same in return. Many will provide regular call-ins to keep you up to date and preserve your peace of mind. And once the delivery is complete to your satisfaction, please take the time to rate and review your driver before casting off. This entry was posted in Boat Shippping and tagged boat shipping, boat transportation companies, how to ship boat, ship boat. Bookmark the permalink.